Brioche Bun Recipe is easy to make from scratch and almost effortless if done properly. I love the smell of a freshly baked sweet brioche bun in my house! I am sharing my grandmother’s authentic French soft brioche bread roll recipe so that you can make these brioche buns too! Learn how to make brioche buns further below with the step by step instructions and tips on how to prepare a yeast dough. Brioche is a partially sweet, buttery soft bread commonly prepared in France. What makes brioche bread different to other bread and buns is that it contains a good amount of butter and milk. That is why brioche is flakey, soft, fluffy and buttery good. Slight sweetness is often while added but not always a must, however, a golden baked surface makes any good brioche bread. Brioche bread can be formed into buns, rolls, toast bread, brioche rolls and bigger loaves. Traditionally, brioche bread is turned into one big braided “loaf”. I personally prefer the brioche bun shape because I tend to give a few away and rolls are just easier to handle in a smaller oven. 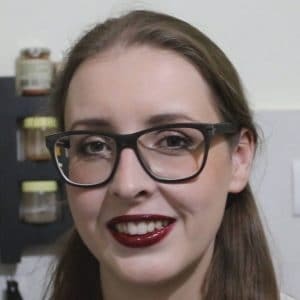 How to make Brioche buns? To prepare this brioche bun recipe is easy. It’s a brioche bread recipe passed down by my mothers French family, which was prepared almost daily. My grandmother would prepare her homemade brioche the night before, the gorgeous looking dough would rest overnight and in the morning she would bake it easily without wasting time. I like this approach and after having tried a few different recipes and dough tactics, I came to the conclusion that her recipe is a solid success! So in the evening, I prepare the yeast dough. I let it rise in its own time, work it out again, let it rise overnight completely, take the dough the next morning, shape it, leave it to rise a bit more, cover with egg yolks and bake it. That’s it and you can do this easily as well! Brioche bread is a very basic and simple bread, nothing fancy but homemade brioche bun does taste sensational, which is why I love to make brioche. If you are getting into baking, then this brioche bun recipe is perfect for you! Easy basic brioche bread recipe is prepared with ingredients in your pantry including flour, sugar, yeast, salt, eggs, milk and butter. How to make sure the yeast in the brioche bread rises? Use quality baking flour to make brioche buns and pick active yeast or fresh yeast with which you have worked before or use this active yeast. Quality yeast makes your life easier and helps you create perfect brioche buns. Baking flour, aka bread flour, contains more gluten which is needed to turn your brioche bread soft. If you can’t get baking flour in your country than just ask in your grocery store for gluten rich flour. That will make your life easier! The addition of small quantities of sugar in brioche bread is an advantage since the sugar will “feed” the yeast and create fluffy sweet buns easily. Therefore, if you are baking with yeast for the first time, you will enjoy preparing this brioche bun recipe. The sugar in the yeast will be your friend and alley this time! Trouble with getting yeast dough to rise? Why is my brioche dough not rising? Used poor quality all purpose flour. The yeast is a living organism and needs to eat the flour to rise and the more gluten the flour contains the more elastic the dough will be. That is how air pockets and lightness are created in a yeast dough, therefore pick a quality flour. Used poor quality yeast. The yeast is usually the most common reason why your brioche dough is not rising. You changed some ingredients or the amounts a lot in the brioche recipe! For example, in a dry climate less Milk can result in a dry dough and turn the dough stone hard and that can be another reason for it not to rise. Or you added way too much salt. Stick to the bread recipe. You didn’t work out the dough long enough into a smooth dough. You didn’t let the dough rest long enough. Give the yeast time to rest and rise. The dough environment is not suitable for the dough to rise. Yeast dough is a living organism. That means if the environment is too cold or too hot, the yeast will struggle and won’t ferment as it should to get the dough to rise. The room temperature and weather for the dough to rise are often while overlooked reasons why the yeast dough doesn’t rise. Besides the room temperature, you need to look out for the humidity in the air. Tropical climate/High humidity has an adverse effect on the rising of the brioche dough. To solve the temperature and humidity problem for your yeast dough, try to adjust in small quantities the amount of liquids added to the dough. High humidity in the air means the flour will be more humid as well, so in that case try to add little fewer liquids. The room temperature is usually automatically higher in a high humidity environment, so a trick is to use cool liquids in the brioche dough. The point is to keep the dough cool but not ice cold or hot. Remember yeast is a living organism and it dies at 40 celsius/104 Fahrenheit! I found here a few valid and useful tips from commercial bakers to rise yeast dough in a tropical climate. Those are all great tips and observations which I adhered too when I was preparing yeast dough in the tropics. Tropical climate yeast dough rising trick! Before I keep my freshly made dough to rise, I warm up my oven for less than half a minute until it’s nice warm inside and then I just pop in my flour and cloth covered dough so that it can rise beautifully. I do this because yeast needs to rise in a warm and, most importantly, dry environment. While following this trick please keep in mind that yeast is a living being and that it will die (and in turn not rise!) if the environment is above 40 Celsius/104 Fahrenheit. Back in Austria, when I visited the hotel management college, we had a heating cabinet where we would keep our doughs to rise and my trick with the oven is basically a copied approach to the heating cabinet. Brioche bread is very French. Here is a great short brioche bread historical read. The eggs in combination with the high amount of butter in a brioche bread turn a brioche slightly yellow in shade. It appears more yellow than other bread just because of the high egg amount. Besides that, egg yolk is brushed over the unbaked brioche bread. That way the brioche gets a deep golden shade on the bun surface during the baking process. Why is my brioche dry and/or dense? A brioche gets more dry and dense when the liquids added where not sufficient. This happens a lot more ina dry climate as the weather and environments are dry. In that case, while working out your dough add a tiny amount more milk to the brioche dough. Also, make sure to use quality flour and yeast and work out your dough into a smooth bouncy dough. Also the longer you keep the dough to rise the better the French brioche buns will turn out. That is why the overnight rising trick for brioche bread is so useful and this step will most probably result in lovely flaky, soft, light and fluffy brioche buns. Another reason for a dry dough is the baking time and heat. Stick to the time and heat mentioned in the recipe (+/- 5 mins depending on the over). Baking too long on high heat will result in a dry dough. Test your sweet buns to check if they are done baking by poking into the hot bun with a skewer. If raw dough is left on the skewer, you need to give the dough some more minutes to bake. Usually, the golden crust is another great indication of a perfectly baked brioche homemade bun! How long will brioche last? Homemade Brioche bread usually last for 2-3 days at normal room temperature, that means in a dry climate. In a highly humid climate homemade buns will not last not more than 1 day, mold will form. Can you freeze fresh brioche? You can freeze the just baked brioche buns. Allow the freshly baked buns to cool down on a wire rack. Then wrap them individually into a clean wrap and store them in a paper bag in the freezer. That way you can freeze the brioche buns up to two months. To use the buns, take out and let them thaw before enjoying the brioche. Cooling Rack (also a roasting rack) – Useful after baking, so that the buns cool down evenly. Bread Proofing Basket Set – For serious bread bakers! 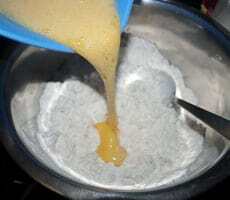 In a mixing bowl combine the dry ingredients first, 250 grams flour, sugar, and salt. If you use dry active yeast instead of instant yeast, mix the yeast into the lukewarm milk (The milk must not be hot or the yeast will die!) and wait until you can see some bubbles form (that's to test if your yeast is alive and healthy). For fresh yeast just crumble the yeast cube into the other ingredients. Add the milk and yeast to the dry ingredients. Break the Eggs into a bowl and whisk them. Add them too to the flour mixture. 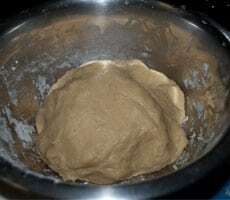 Mix the whole flour bowl content well and work it out into a half smooth ball. Then add 5 smaller batches of the soft butter to the dough, one at a time and always add some of the remaining 80 grams of flour until you have used it all up. Turn the dough into a smooth ball, cover with some flour and a kitchen cloth and place in a warm but dry environment for 2 hours to rise. After 2 hours of rising, your dough should have doubled in size and have cracks on top. Test by poking into the dough with your finger, you should be able to feel soft airy dough going getting pressed down. Work out the dough shortly so that the extra air comes out. At this point I keep the brioche dough in a covered bread proofing bowl overnight out or in the fridge to rest. The next morning, work out your dough once again with some extra flour and form into 8 equal balls. Place into a greased mold and keep to rise again for 1/2 hour. Once they have risen again, preheat your oven to 180 Celsius/356 Fahrenheit and mix 2 egg yolks together and brush the yolk on top of the rolls so that they will have a golden finish. Bake for 20-25 minutes, at 180 Celsius/356 Fahrenheit, or until the homemade brioche is done (check and poke into the bread with a skewer, if it comes out clean, it's ready). 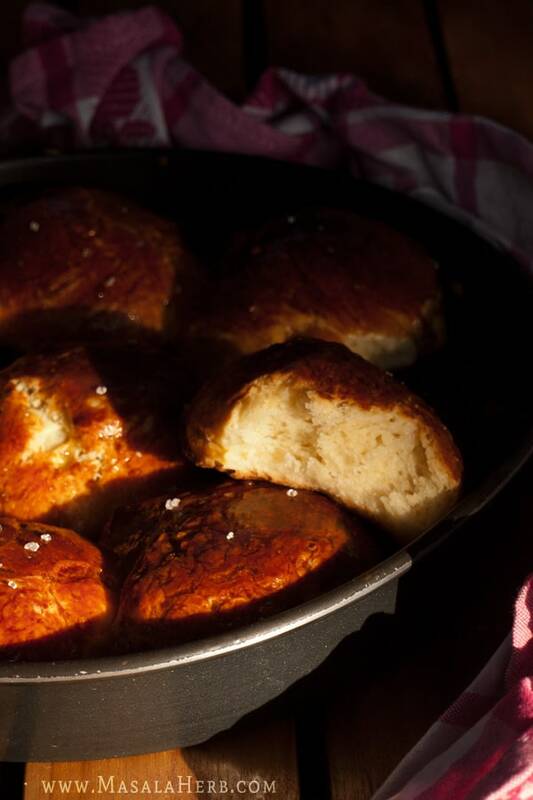 Keep the freshly homemade baked brioche bread to cool on a cooling rack. To make things easier with the yeast, use instant dry yeast instead of dry active yeast as you don't need to dissolve instant yeast in the milk. Fresh yeast is usually very reliable if you pick that use 12 grams fresh yeast. Use a stand mixer to beat the dough The dough needs to be worked out for about 10 minutes if you do it by hand. Let the dough rest properly as described in the recipe for the best results for a flaky soft fluffy and light brioche bread. For a golden crust, brush egg yolks over the shaped rested rolls just before baking. To test if finished baked, poke into the roles and if it comes back clean the roles are ready. Let cool on a cooling rack. After the brioche buns have cooled down, you can freeze them. For breakfast with butter, jam, honey or cold cuts. 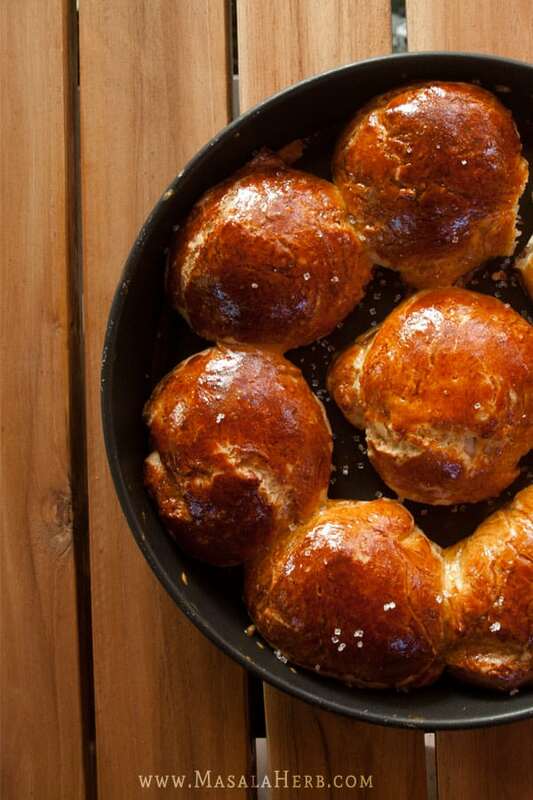 Dear Reader, how are you planning to enjoy the Brioche buns? The post, Brioche Bun, was first published on the 12th Jan 2014 and has been updated and enhanced ever since. Wonderful! Homemade brioches are so delicious. Nothing like those old family recipes for success. You know it’s tried and true and I’m so glad you shared this one for the Sunday Supper anniversary. These brioches look so delicious. I can’t get over how golden and perfect these brioche look! I have never attempted to make some myself, but I really need to put it on my to do list very very soon! I don’t believe I’ve ever seen a prettier brioche! The color you achieved is spectacular! Perfection! Really, these are so golden and beautiful. I have to put brioche on my to-make list very, very soon. Absolutely gorgeous!!!! Love Brioche rolls!! I have been trying to “pin” this several times and it says “not a valid image” . . help! These brioche buns look divine! It’s great to have you back! So glad you made this beautiful recipe by Donna! It is just fabulous and I can’t wait to try it. Thank you for being part of the Sunday Supper Family. Your grandmother was a very smart woman, Helene. I love that she made the dough the day before so it could be popped in the oven the next morning. I finally tackled brioche myself for the first time and it is so much easier than the hype led me to believe. Your buns are such a gorgeous golden brown! 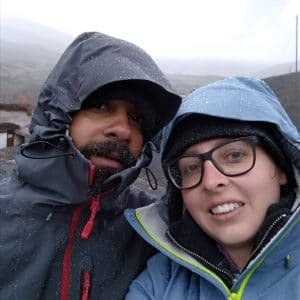 I am jealous that you are finding fresh yeast in India. I have yet to locate a source here in urban Dubai! Wow these look fabulous!! Warm and hearty, so glad you decided to join us again! Happy Sunday to you and yours. My husband loves making brioche and I am very happy about that!! Yours looks so gorgeous, love the deep rich looking color!! Oh my heavens. 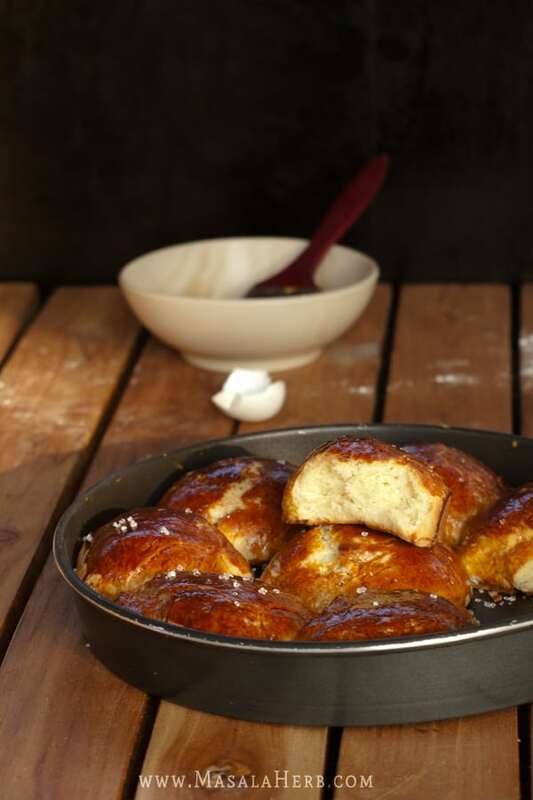 We LOVE brioche around here. We’ll eat it plain with nothing on it, and feel so guilty, because it is just SO GOOD. LOL Gorgeous recipe. Splendid! I love brioche but for all the yeast baking I do I have never made it! I love the step-by-step pics which is something I really appreciate when attempting something that makes me rather nervous. Lucky you for having a grandmother who made it. Lovely! And yes, the perfect breakfast. I love brioche! It’s not a bread we make that often, and should. I have really good luck with instant yeast. You can just mix it in with the dry ingredients – no need to proof. We buy it by the pound and store it in the freezer. It keeps for a couple of years at least that way, which is about as long as it takes us to go through that amount! Good post – thanks. I am in awe of your brioche – absolutely beautiful! Lovely idea to do it as little rolls to share around. Homemade brioche is always such a treat and your rolls look wonderful! What a beautiful photo of your very delicious looking Brioche. I am going to have to try this recipe! 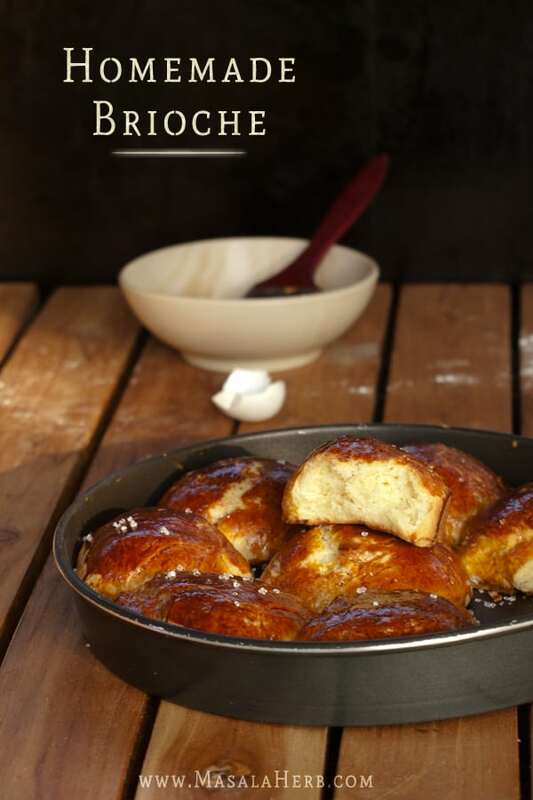 I have never made brioche, but reading this, I now have the confidence to do it! Your brioche looks so amazing with the deep golden coloring! My mouth is watering! Your brioche looks divine. I never even thought of the regional differences of yeast, even commericial yeast! Thanks so much for pointing that out. I make a lot of bread and I never even thought of it. Nice to see you Helene! Your brioche looks so tender and flaky! Hmmm…this is the second homemade brioche recipe I’ve seen on #SundaySupper today. Very impressive and I may have to make an attempt myself. Helene, I love brioche and I don’t make it often enough! The best brioche I ever had was when I was studying in Paris. I keep meaning to try my hand at making it, but non of the recipe pictures look like what I remember. Yours looks very close. So I’m excited to give it a try! How fitting, Helene, to introduce your family brioche recipe to the Sunday Supper family =) Your bread – besides – #SS’s second birthday truly is a cause for celebration…Your brioche truly looks like the sort I loved in Paris! I used to work in a bakery during my college years and simply adored brioche! Yours looks so heavenly Helene! I wish I had me some to nibble on tomorrow morning! G’day Helene! What a GREAT round up and I LOVE brioche too! Pinned your photo…shared with Twitter and is on my list to do! Thank you! Ooh I’m craving your Brioche so badly Helene! !It looks so moist,so fluffy,so delicious! !I really have to start baking bread sooner than later 🙂 Glad to see you back for Sunday Supper and its been so much fun cooking with you! Wow these look absolutely amazing. I wish I had the baking chops to churn out something as gorgeous as this bread! The golden colour you got with your brioche is gorgeous would love to have some right now. Oh my goodness! This looks like the very best treat you good dream of waiting for you in the morning. These look amazing Helene! You bake so well. I had heard Eno works very well in place of yeast, is that true? Really eno?! I have never heard this before but I ll research a bit. I think it might be related to baking soda but I can’t imagine that it can replace living beings such as yeast. Will need to check out, thanks for that Minnie! humm. I just left a comment but its not showing up? I will try again! It looks amazing. Love the brioche and you make it look sooo easy! Brioche is my favorite bread! I need to make this just so I can have brioche french toast. Yummmmmm!!! Brioche!!! I do not have patience for bread, but brioche is one of my favorites. Beautiful picture, Helene! Wow these rolls look perfect! I’ve always wanted to try making broiche, but sometimes I get intimidated by the whole loaf thing … making it into rolls is the perfect solution! What a lovely recipe, thank you for sharing your dear Grandmother’s recipe, I’ll definitely give it a go because we love brioche too! agree! I wish I had the baking chops to churn out something as gorgeous as this bread! I love making homemade bread, and often buy brioche. This looks like a fun kitchen experiment on a cold, snowy winter day. More fun to play in the kitchen where it is nice and warm. Lots of interesting information about brioche that I didn’t know and what a fabulous recipe! Thanks for reposting this. Love it! 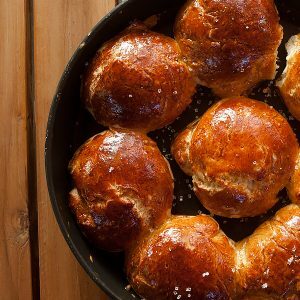 Hi, this may be interesting you: Brioche Bun Recipe - French Brioche Bread Roll!